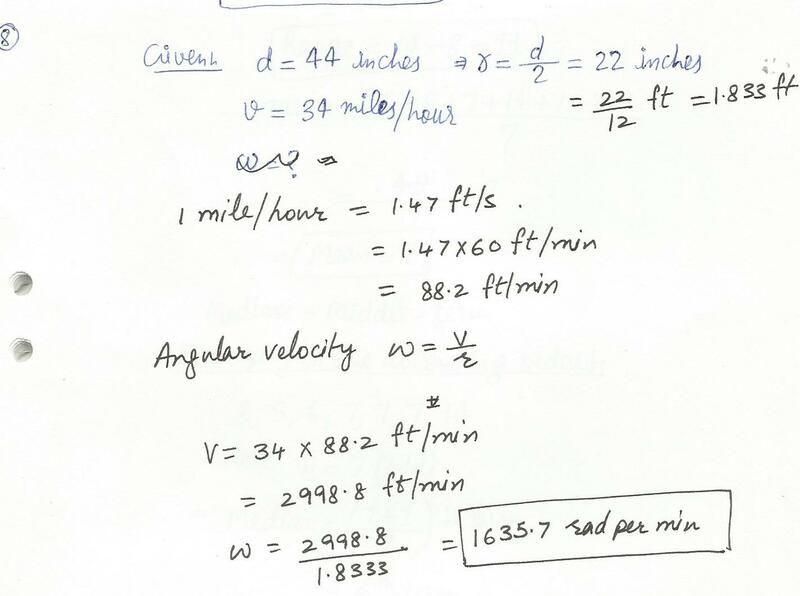 The wheels of Andrea,s car had a diameter of 44 inches.If she was traveling at 34 miles per hour, what was the velocity of the wheels in radians per minute? 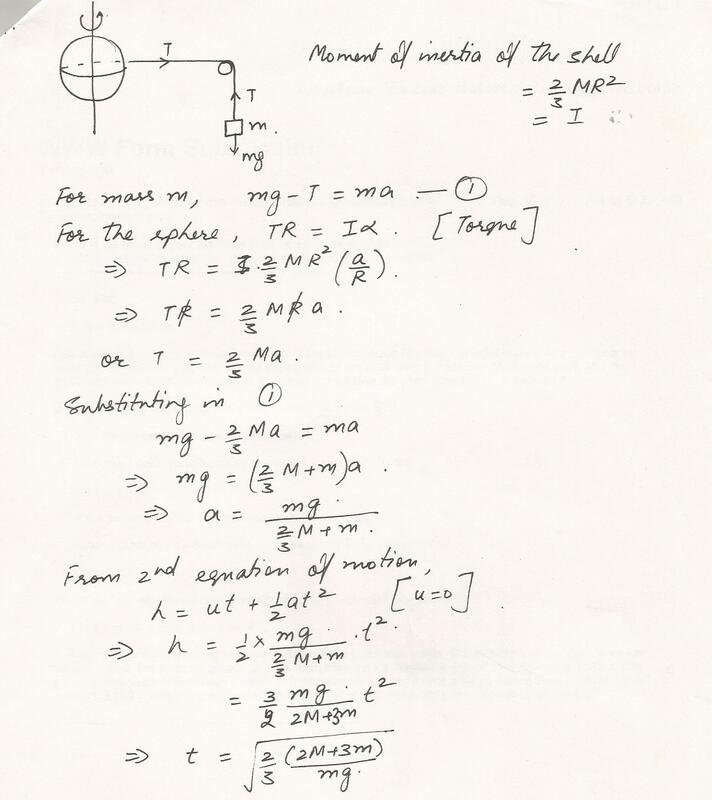 A uniform spherical shell, with mass M and radius R, rotates about a vertical axis on frictionless bearings. A light string passes around the equator of the shell, over a massless,frictionless pully, and is attached to a small object of mass m.How long does it take the small object to fall a distance h? 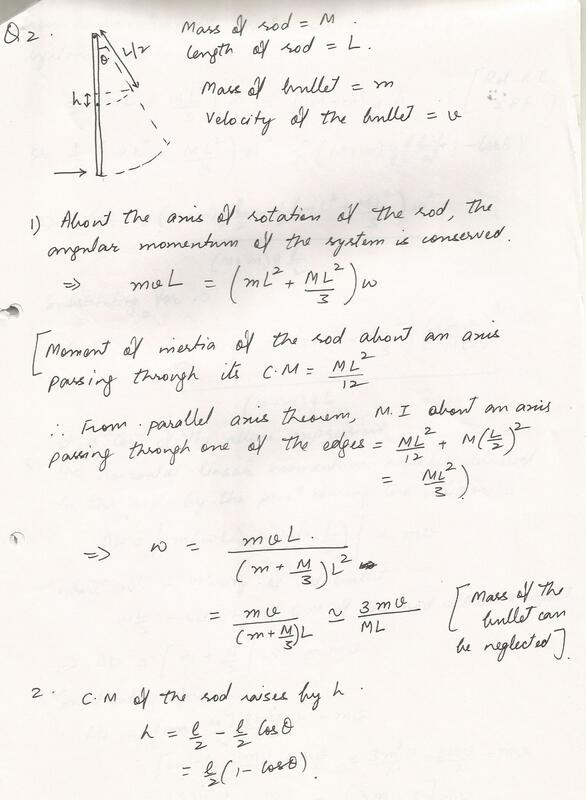 On the basis of conservation of angular momentum, discuss why a helicopter must have more that one rotor(or propeller). 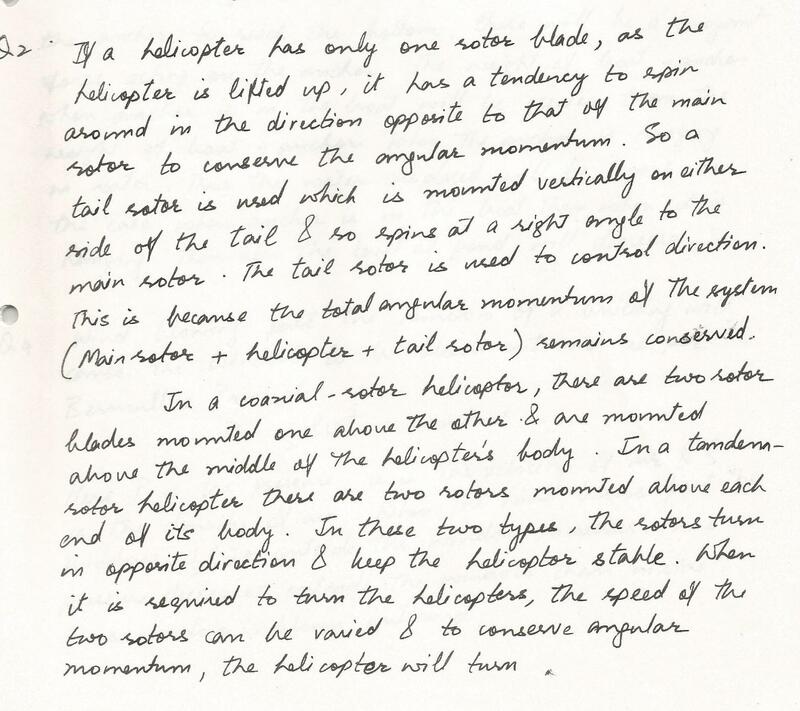 Discuss two or more ways in which the second rotor (or propeller) can operate in order to keep the body of the helicopter stable. Stars originate as large bodies of slowly rotaing gas.Because of gravity, these clumps of gas slowly decrease in size.What happens to the angular velocity of a star as it shrinks?Explain. 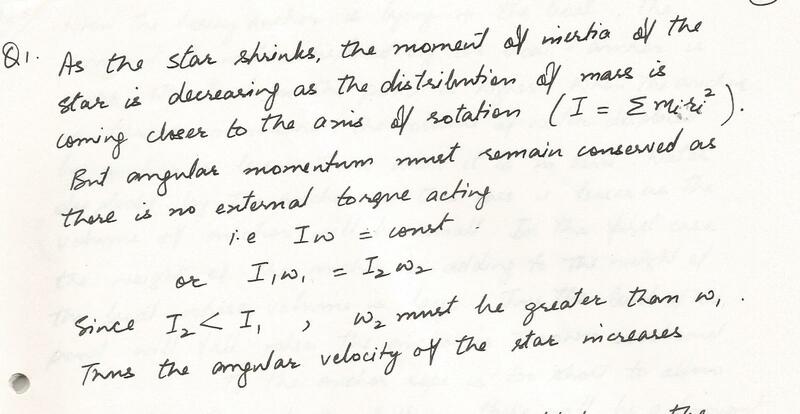 Derive an expression for the horizontal linear momentum impulse delivered to the rod by the pivot during the collision. 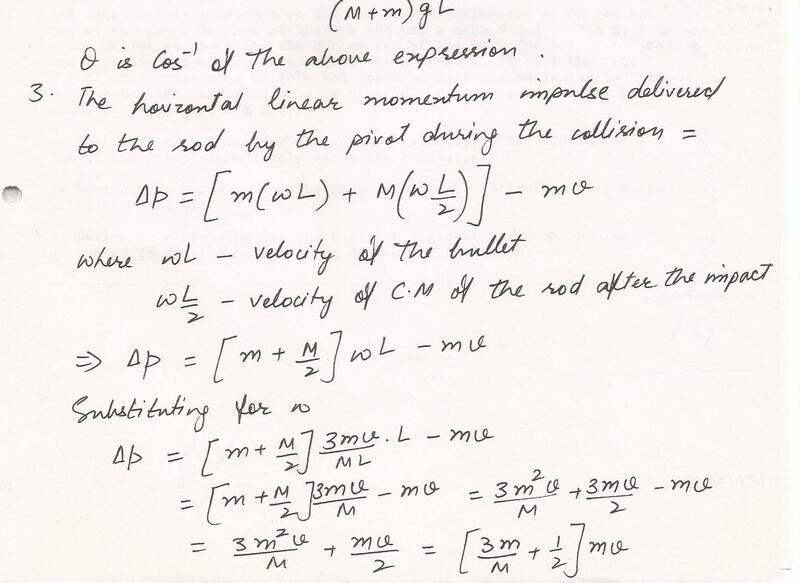 Derive an expression for the angular velocity of the rod+bullet (about the pivot) immediately after the collision. A Yo-Yo sits initially at rest on a table top. The coefficient of static friction between the Yo-Yo and surface of the table is 6/10. 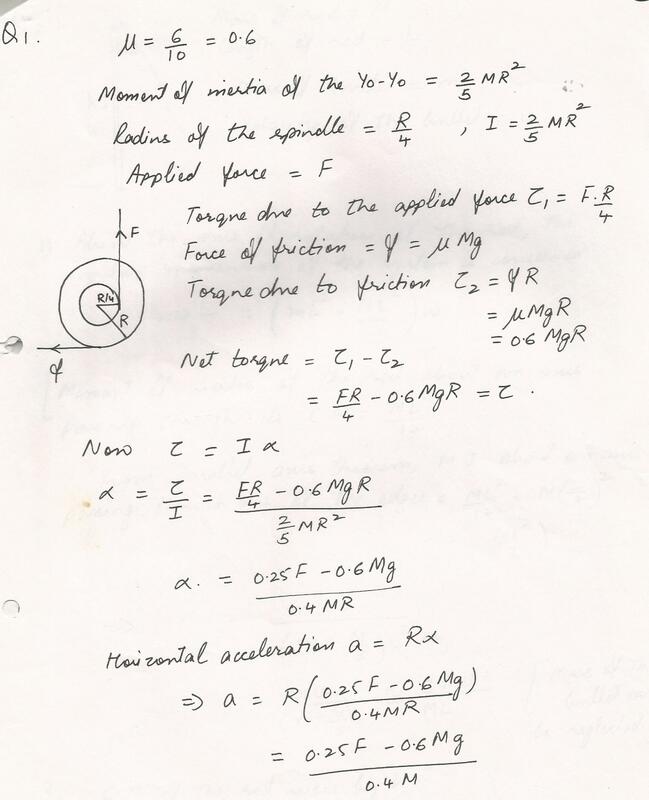 The Yo-Yo consists of two disks with a rather thick central spindle, around which is wrapped some string of negligible mass.the moment of inertia of the Yo-Yo is 2/5 m R^2; where R is the outer radius of the Yo- Yo and M is its mass.The radius of the spindle is R/4. Neglect the thickness of the thin'' massless'', string. A Persion pulls straight up on the string with an applied force F.
What is the largest HORIZONTAL acceleration thatcan be given to the Yo-Yo by this method.Express your answer as a multiple of g.
Three point mass particles are located in a plane;3. 61 kg located at the origin, 5. 8121 kg at [(6.72 cm); (13.44 cm)], and 1. 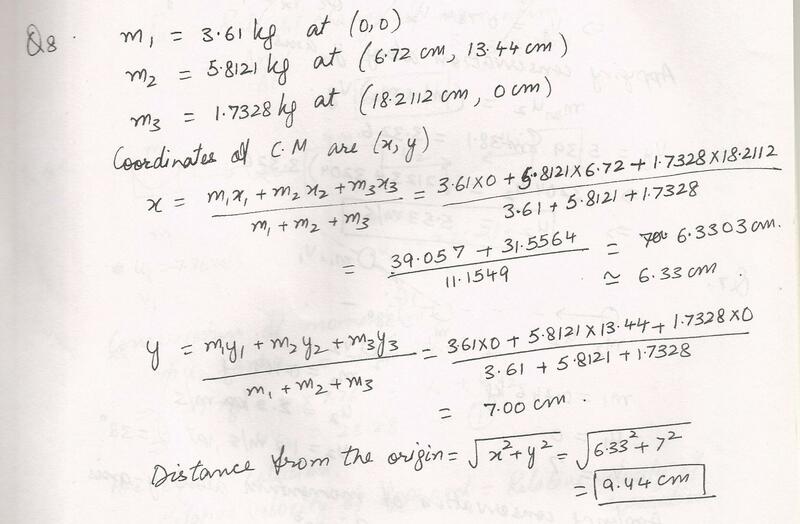 7328 kg at [(18.2112 cm); (0 cm)].How far is the center of mass of the three particles from the origin?Answer in units of cm. A rotating 5 kg solid flywheel (disk) has a radius of 50 cm and an angular velocity of 20 rads/second. 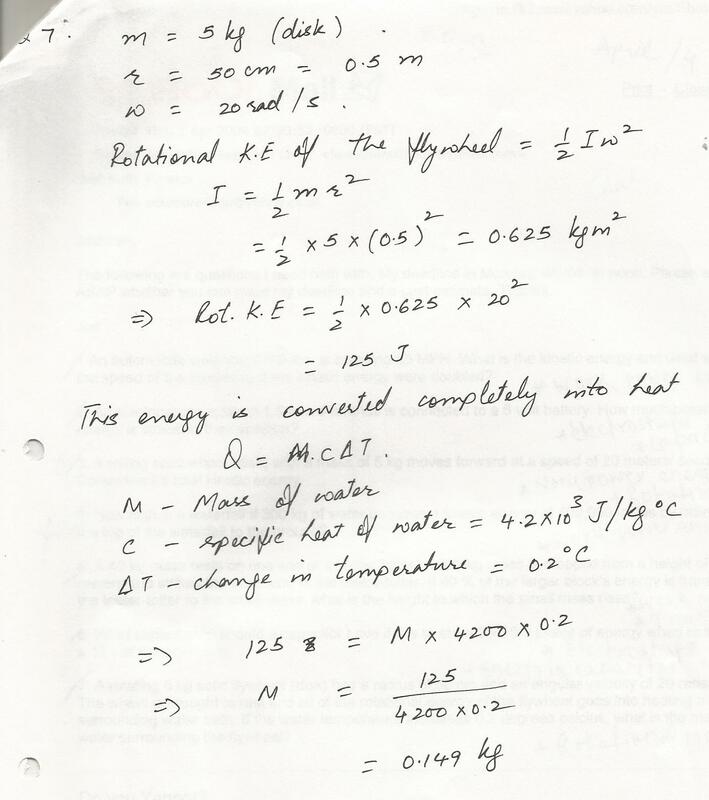 The wheel is brought to rest and all of the rotational energy of the flywheel goes into heating a surrounding water bath.If the water temperature increases 0.2 degrees celcius, what is the mass of the water surrounding the flywheel? A 60.0-kg skater begins a spin with an angular speed of 6.0 rad/s.By changing the position of her arms, the skater decreases her moment of inertia by 50%. 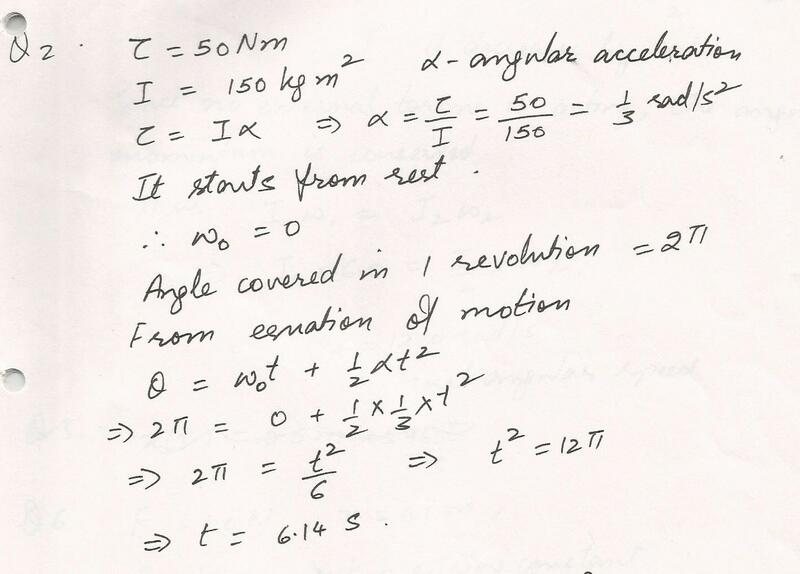 What is the skater,s final angular speed? A string is wrapped around a pulley of radius 0.10 m and moment of inertia 0.15 kg.m2 The string is pulled with a force of 12 N. What is the magnitude of the angular acceleration of the pulley? 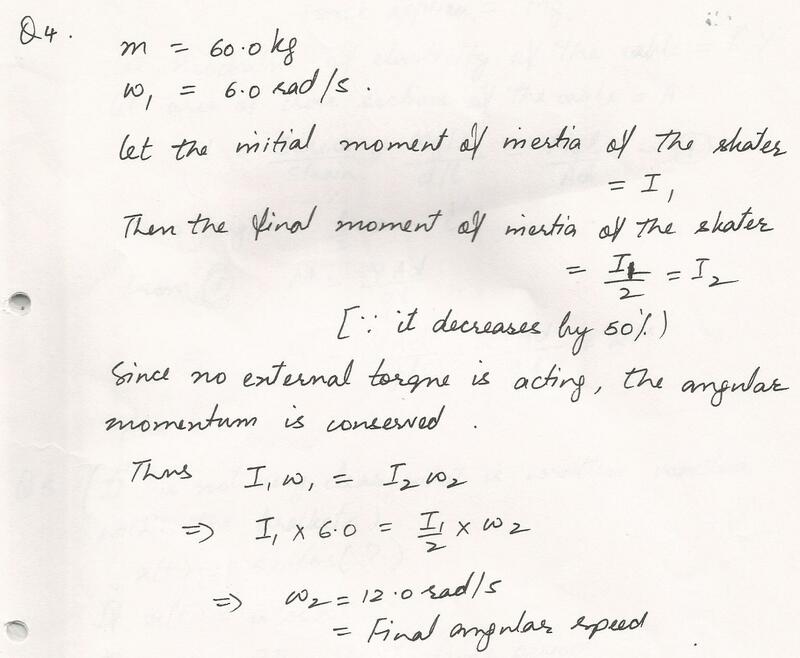 A 50 N.m torque acts on a wheel of moment of inertia 150 kg. m2. If the wheel starts from rest, how long will it take the wheel to make one revolution? A meter stick is pivoted at the 0.50-m line. A 3.0-kg object is hung from the 0.10-m line.Where should a 5.0-kg object be hung to achieve equilibrium? Displaying 1-15 of 497 results.